Legendary heroes wield great weaponsto bring justice to those that would prey upon the innocent. Tempered in the fires of divine providence or arcane might, these instruments serve to lay low the forces of evil. 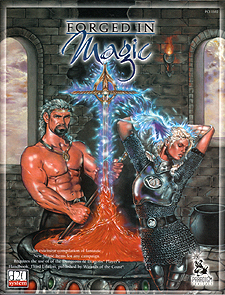 Forged in magic is a 128-page supplement for the D20 system for use in any fantasy D20 campaign setting. This Sourcebook details over 400 magical and psionic items and those that forge them. Also included are ideas on how to make magic items that will be identified with your legendary heroes for generations to come. An extensive compilation of fantastic New Magic Items for any campaign. Requires the use of the Dungeons and Dragons: Player's Handbook, Third Edition, Published by Wizards of the Coast.